Pies! Pies! Pies! 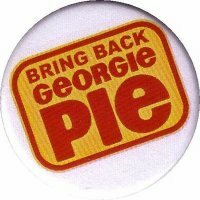 oh I miss Georgie Pie – a fast food chain that was around when I was a kid in New Zealand. When I go home to New Zealand, one of my must haves are meat pies. Meat pies and ketchup are part of our culture, hence on my list of one of my favorite things. Unroll the sheet of pie crust, cut out the 4 circles – you may need to re-roll edges to get the 4th one. Place each into the pie dish. Place the chopped onion, bacon and frozen pies on the bottom of each pie crust. 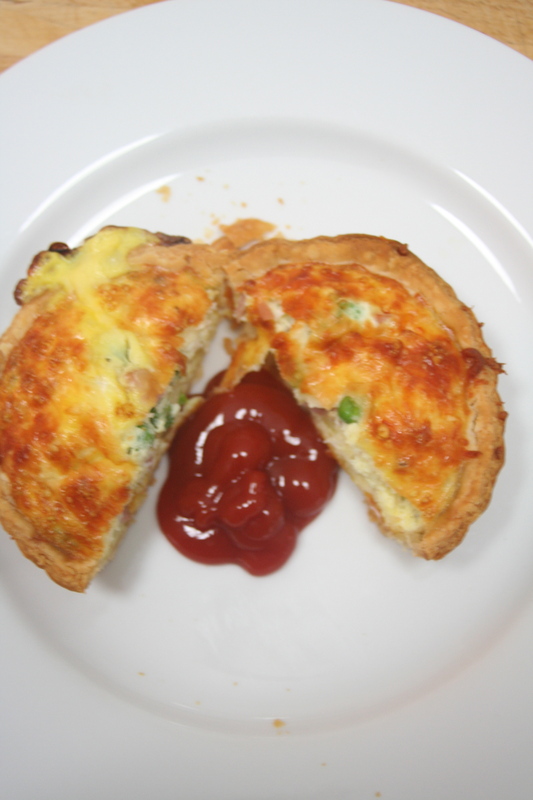 Add the egg mixture, salt and pepper over the top to cover the filling (~3/4 fill). I stir the ingredients slightly. NOTE: The egg will rise to look like a mountain – don’t worry as when it cools it will deflate slightly. Cook potatoes in salted boiling water for ~15 minutes. Drain the water when cooked, add butter and milk and mash. Allow to cool. Heat fry pan, add oil. Add the onions and cook until clear. In a cup add the flour and slowly stir in the stock, you are making a gravy – you don’t want lumps :-). Add it to the ground beef. Add Ketchup, seasoning and 1/4 cup of frozen peas. Take mixture once heated through off the heat and put aside to cool. 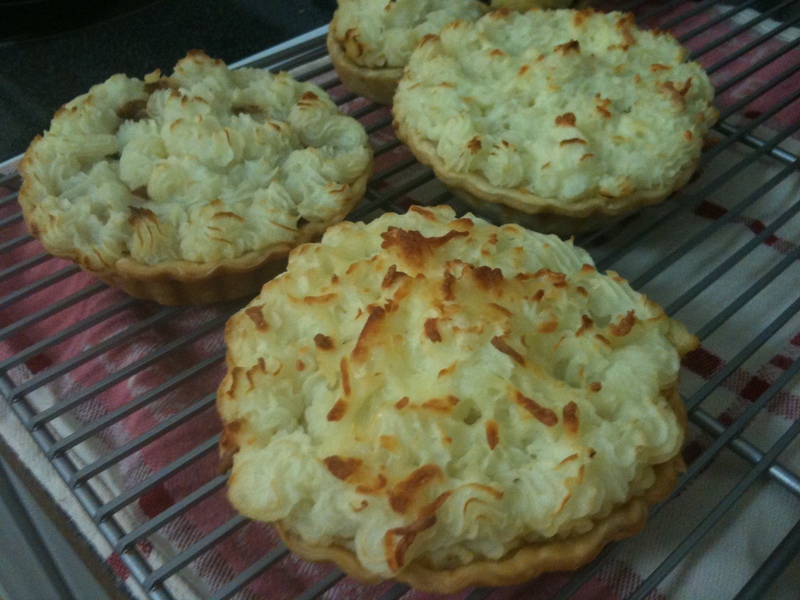 Put a 1/4 cup of the mince in each of the pie crusts, fill 3/4 of the pie. In a piping bag, add mash potatoes. Pipe the potatoes in to rosettes on the top of the mince mixture. Cover the top completely with rosettes. Sprinkle with Cheese (you could add a sprinkle of paprika for color on the cheese). Cook for 15-20 mins or until the top becomes golden. Take it out, allow to cool for 5 mins. and server with ketchup ;-). 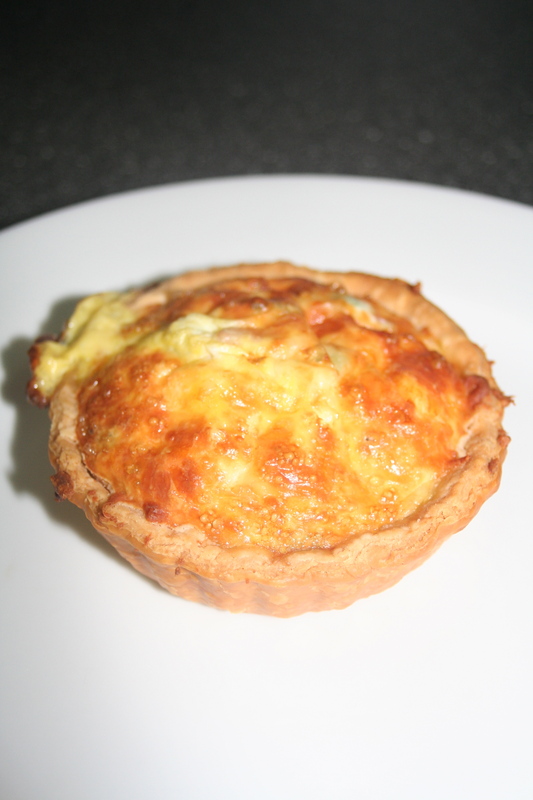 This entry was posted in Uncategorized and tagged bacon and egg, bacon and egg pie, dinner, food, Georgie Pie, meat pies, pastry, pies, pillsbury pie crust, potato top pie, recipe, recipes, savory on September 13, 2012 by mlwilkie.